As the sports marketing agency for Dairy Management Inc. (DMI), Team Services coordinates DMI’s involvement at the NFL Draft each year, providing unique opportunities to students involved in the Fuel Up to Play 60 (FUTP 60) program and assisting with onsite activations with students. 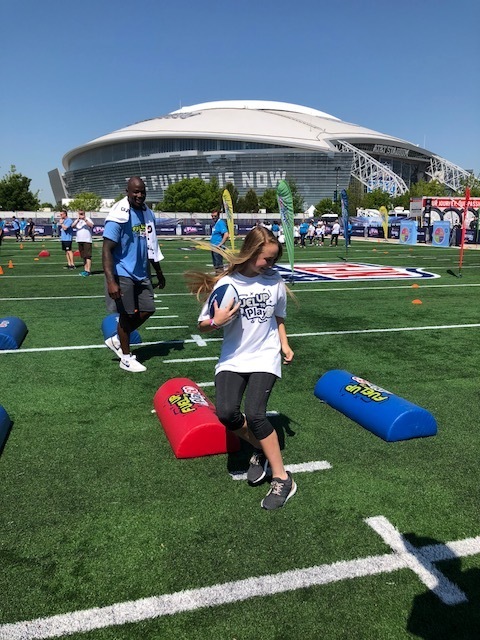 This year, the local dairy council kicked off NFL Draft week in Dallas with a FUTP 60 Touchdown Celebration, hosting nearly 500 students at AT&T Stadium. The students heard from Charlotte Jones Anderson, the Dallas Cowboys Executive Vice President and Chief Brand Officer, at a health and wellness assembly led by former NFL players JJ Moses and Bradie James, then ventured outside to run skills and drills with former Dallas Cowboy, DeMarcus Ware. In addition, Trinity, a FUTP 60 student ambassador from the Dallas area, was hand-selected as the NFL Draft Kid Reporter, reporting on the exciting week of activities at NFL Draft. Team Services worked closely with the NFL to coordinate access to exciting moments throughout the week providing her the opportunity to interview NFL Draft prospects, active NFL players and NFL legends. She attended the Prospect’s Play Football Clinic and the NFL Draft Red Carpet; Trinity also acted as a reporter in the media room following player selections during Round 1. Then, to cap off the week, she took the Draft stage and announced the Cowboys 7th round selection. Team Services staff was on site all week to help the local dairy council orchestrate events and capture content of the Kid Reporter on behalf of DMI. It was an incredible week with great opportunities for FUTP 60 and its participants!